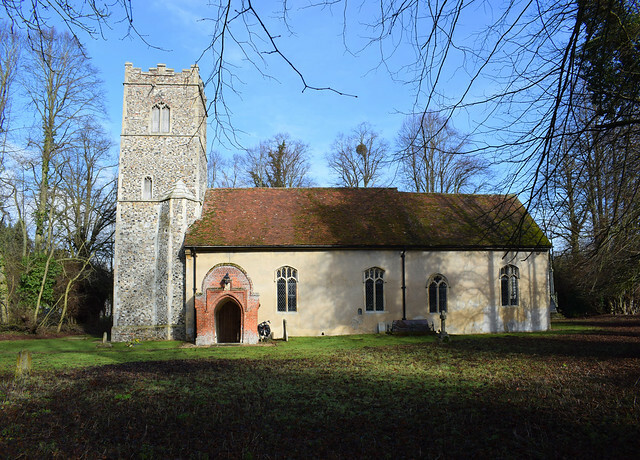 Suffolk's most secret places are among the twisting valleys to the west of Ipswich, the little churches hidden in glades on hilltops or in the dips below where the narrow lanes snake down into groves of ash and elm. Maybe there's a stream nearby, but not many houses; hardly a village at all. The churches in these places are among my favourites. Their ancient stones endure through the shadowy grip of winter, and cool the summer haze. They sit in silence as the centuries go by, far from the mundane bustle of traffic, beyond the scope of the tourist guides. Nettlestead is one of these places. The pretty unbuttressed 14th century tower shows evidence of Norman work in its lower reaches, although Mortlock thought this may have been found and reset during the 19th Century restoration. 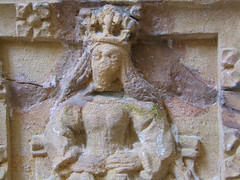 Similarly, a Norman lancet window in the north wall is surmounted by a reset delicate carving, interlacings of beads, arches and scrolls. You see such things in the Victoria and Albert museum, but they do not have the same power there, out of context. Here, a thousand Suffolk summers and winters have come and gone and still it endures. 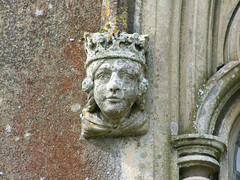 Speaking of Victoria and Albert, their portraits form the headstops to the outside of the east window. 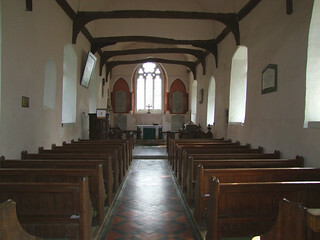 The inside of the church is neat, bright and welcoming. 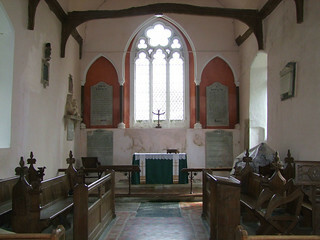 It is easy to describe the interior of a small church as pretty, but Nettlestead really is so, and once stepped into it will not easily be forgotten. 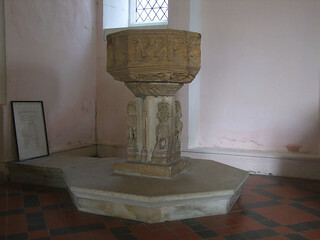 The crowning jewel here is one of Suffolk's loveliest fonts. 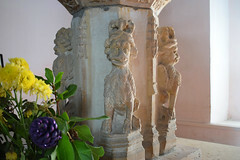 Panels intersperse lively evangelstic symbols with grinning men, one with his tongue sticking out (but could he be a lion? 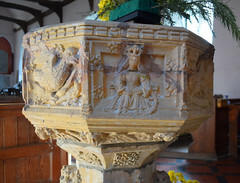 ), a jolly bishop, and, almost surreally amongst all this merriment, St Catherine clutching her wheel of martyrdom. 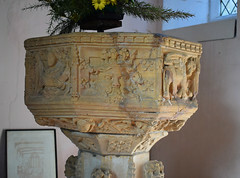 There are noticeable cracks around the bowl, as if at some point it has been seriously damaged. There is a story behind this font and its survival, as we shall see. 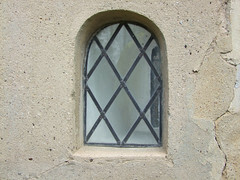 Another curious survival is the large squint in the splay of a window in the south wall. 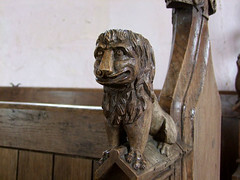 It seems to be focused on where the pulpit is now, so we might assume that there was once an altar in the nave there. But why was the squint where it is? Mortlock thought there might have been an anchorite's cell outside the south wall there, but it is hard to see how an outbuilding could have offered a view through the squint without its east wall cutting into the window. 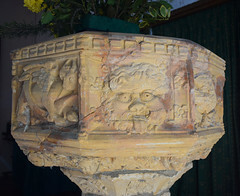 I wondered if the Easter sepulchre had been built where the pulpit is now, and the squint allowed parishioners a view of it on Good Friday, when the church was out of use. Cautley doesn't mention the squint in his 1935 survey, so it was probably uncovered during a major restoration after the war. 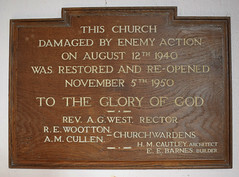 On the night of 12th August 1940, this pretty church suffered the same fate as that at Akenham, six miles away, when German bombers returning from a raid on the Midlands dropped their remaining bombs in a swathe across this part of rural Suffolk before embarking on the crossing of the North Sea. The church was gutted, and its restoration and reopening in 1950 was one of Munro Cautley's last jobs for the Anglican diocese. 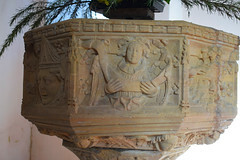 He is responsible for the meticulous piecing back together of the font, which was wrecked in the explosion. 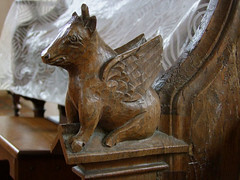 The east end of the sanctuary is a curious thing, too. 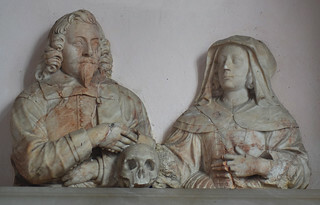 Its rather sober classical blank arcades are elegant, but beside them is the grimly morbid early 17th century memorial to Samuel and Thomasina Sayer with their pet skull in the north wall. Sayer built a faire almes house at Bewdley in Worstershier for six poore men and gave thirty powndes a yeare for ever, but he seems none too happy about it. 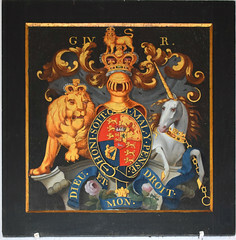 Rather jollier are the lion and unicorn on the George IV coat of arms, which, instead of supporting the shield, emerge dramatically from behind it. 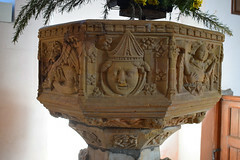 As lovely as this church is, only the font has survived today from the Medieval period. But there was once much more. 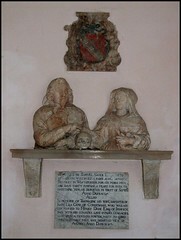 The iconoclast William Dowsing visited Nettlestead on 22nd August 1644. 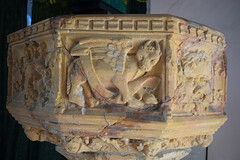 It was one of seven churches he visited in the area that day. 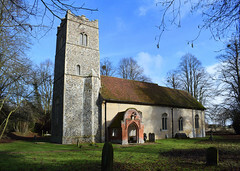 One of his houses was in the adjacent parish of Baylham, and these small churches are close together, but even so the going on horseback must have been easy that day. He found plenty to do at Nettlestead. The Saints on the screen, of which no trace survives, had not been defaced, and there were a dozen further Saints in stained glass, again none of which survive. 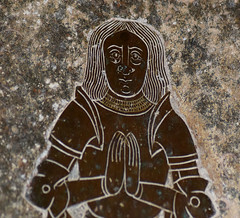 It appears that his instructions with regard to the screen and ancient glass were carried out by the churchwardens in full, and he also noticed a prayer clause in brass which had gone by the time the antiquarian William Blois visited in 1660. 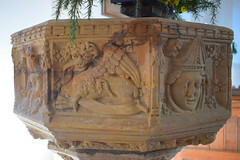 The knight above its matrix survives, suggesting that the inscription wasn't taken by collectors or early modern metal thieves. The armour is early 16th Century and it may be to Richard Wentworth who died in the 1520s in the last days of Catholic England. 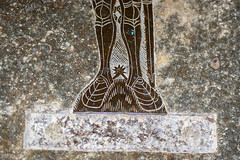 Dowsing does not usually get too worked up about fonts, but he mentions St Catherine on the one here, who survives, unlike her saintly companions in paint and glass, so presumably she was consequently either plastered over, or the font was removed from the church and used as a drinking trough for cattle or something. 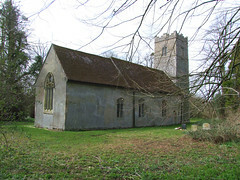 Further, and most unusually, Dowsing names the Saints he sees at Nettlestead, and this despite it being just one of many churches he visited that day. Why was Dowsing so thorough at Nettlestead? The obvious conclusion is simply that, being local, he already knew the church well. And there is one further intriguing connection between Dowsing and Nettlestead. 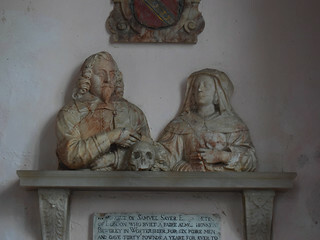 Thomasina Sayer on the Sayer memorial in the chancel was born Thomasina Lea, and she was the sister of Thamar Lea, William Dowsing's first wife. The thought that this wonderful little church once had a medieval screen and medieval glass that had survived the Reformation makes you want to weep. Ho hum. Back outside, then. 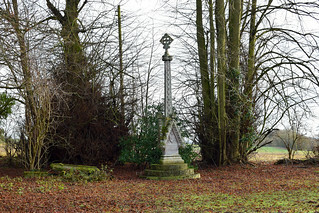 The pompous memorial by the north east hedge to Stephen Jackson, publisher of the Ipswich Journal, is a quite different prospect to the quiet beauty we have encountered so far. 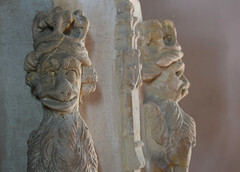 You might see this in the V&A as well, as an example of the arrogance of the Gothic revival. Here is someone who thought very highly of himself, and now lies under flowering columns, pillars, balls, pyramids and curlicues. 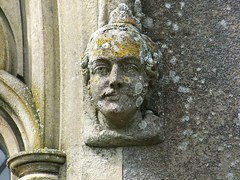 An antidote by the south porch is the memorial to a child who died after just ten hours. Just a Perfect Day, as the inscription reminds us. 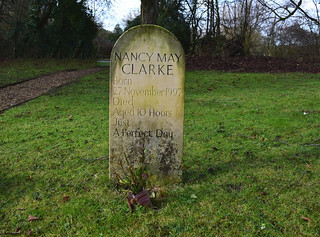 It's one of the loveliest modern memorials I know in Suffolk. 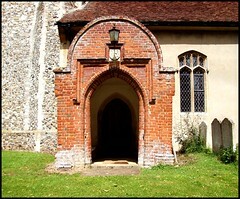 So there you are, what a delightful little church this is, how can you possibly resist? And then, if you are on foot, or on a bike, just keep going. On the other side of Somersham, you'll come to Flowton; equally remote, equally lovely, equally welcoming. If you are in a car - well, you should be ashamed of yourself.